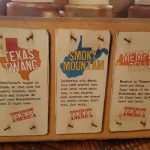 Mission BBQ Troy review, pics, hours, and menu info. The Troy Mission BBQ on Big Beaver just West of Livernois is the restaurant chain’s first franchise in Michigan (another is set to open in Northville in late 2018). 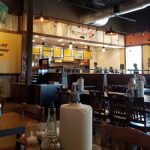 Mission BBQ currently operates in over 15 states and is expanding rapidly. 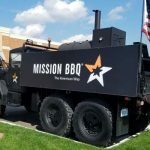 Mission BBQ restaurants have a theme – they not only celebrate armed forces and first responders, they actively fundraise and support them. 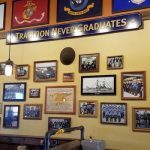 Each Mission BBQ restaurant is adorned with flags, pictures, badges and patches from everything military and first responder. As a patriotic American, the decor brought a smile to my face when I visited. If you’re familiar, Firehouse Subs has a similar first-responder theme (mostly firefighters) with their restaurant. 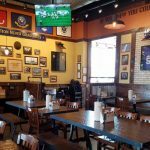 Mission BBQ Troy offers order-at-the-counter service ala Dickey’s BBQ Pit or Billy Sims BBQ restaurants. Place your order, wait a few minutes, and you’ll be called up for your lunch/dinner… often faster than a fast food restaurant. In my experiences, the similarities between Billy Sims BBQ & Dickey’s BBQ Pit END with the ordering style. I enjoy the food at Mission BBQ FAR more than I’ve enjoyed my order up experiences at Billy Sims & Dickey’s. Great quality and really close price points. I’d even compare Mission favorably food-wise with some of the nicer sit-down BBQ restaurants in Metro Detroit like Lockhart’s, Union Woodshop, and Bad Brad’s. 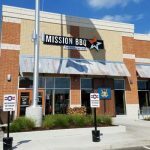 Mission BBQ Troy menu choices include all of your favorite BBQ favorites – Brisket, Pulled Pork, Pulled Chicken, Sausage (3 kinds), Ribs, half-chicken, even salmon. They offer various meat combos, sandwiches, salads too. 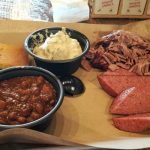 They offer typical BBQ sides like Mac n Cheese, baked beans, green beans & bacon, slaw, fries, and potato salad. I highly recommend the unique potato salad. Kids menu features choice of jr ribs, slider, or kids mac n cheese. 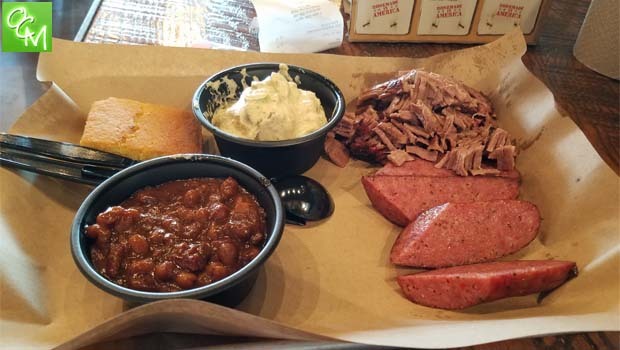 My particular meal was a two-meat combo with brisket & classic sausage with 2 sides – potato salad & baked beans. Combo meals come with the ceremonial corn bread. My meal was delicious. If I’m nitpicking, I’m going to say I’ve had better cornbread and the baked beans, while tasty, were unremarkable overall. I’m a BBQ sauce junkie. 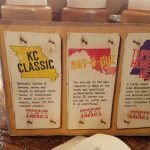 The best part of eating BBQ out is trying ALL the different sauces and I was thrilled to see that Mission carries SIX signature sauces. None of them were “home runs” to me, but they were all very good and enjoyed sampling them all. In addition, I’m told, but didn’t see Alabama White, Craftsman Special, and Georgia Mustard. Maybe this is a regional thing, maybe I just didn’t look hard enough. Misson BBQ Troy Bottom Line – Great walk-up BBQ, decent portions = decent value. Better than Dickey’s & Billy Sims for walk-up style BBQ. Add a star to your ranking system if you’re, like me, patriotic. Add another star if you’re a BBQ sauce junkie.